Please remember to use the MAP Student Portal to RSVP to events and verify locations and times before attending. Thank you! Comments Off on CM Graduation Quick Checks! Are you graduating in May or August 2016? 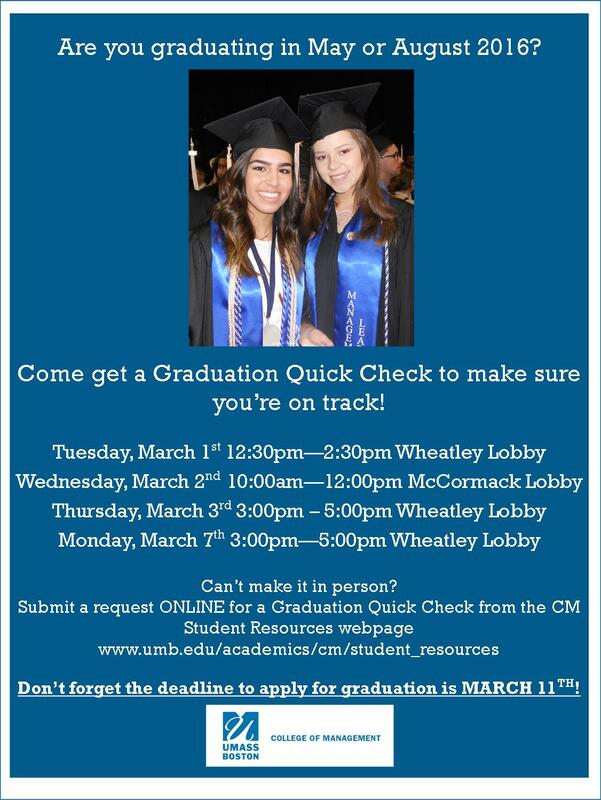 Come get a Graduation Quick Check to make sure you’re on track! Don’t forget the deadline to apply for graduation is MARCH 11TH! Comments Off on LEAP AHEAD with advising this YEAR! LEAP AHEAD with advising this YEAR! Meet with an advisor in the College of Management 2/29—3/4 to get a jump start on planning for summer & fall registration AND take home some CM swag! Our LEAP DAY gift to you is all day walk-in advising on 2/29. Ben, Becca & Mara will all be available for walk-in advising from 9:00am to 11:30am and 1:00pm to 4:30pm. 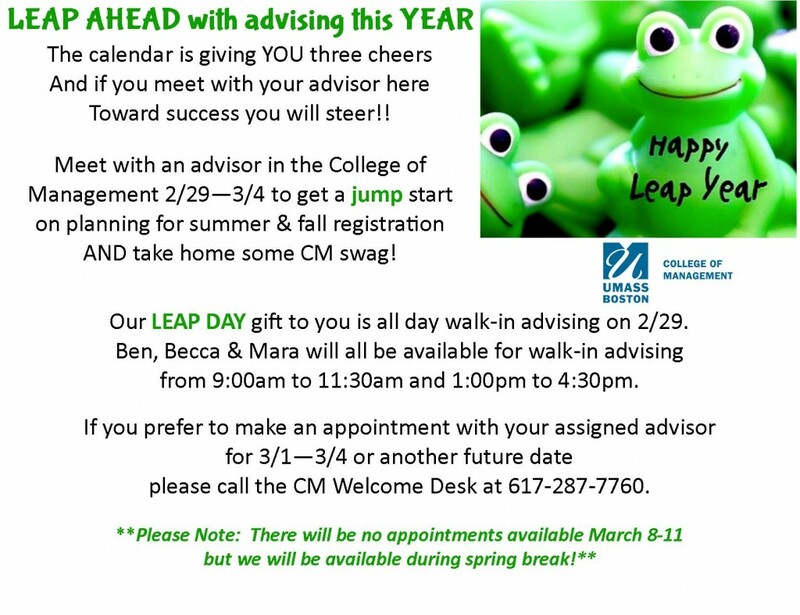 If you prefer to make an appointment with your assigned advisor for 3/1—3/4 or another future date please call the CM Welcome Desk at 617-287-7760. An exciting opportunity is here! Come meet with a Harvard Graduate Entrepreneur! Founder of Quickhelp, Inc, Hikari Senju is here to answer your questions and teach you how to start your own startup! Seating is extremely limited so please email Matthew.Furlong001@umb.edu if you plan to attend. 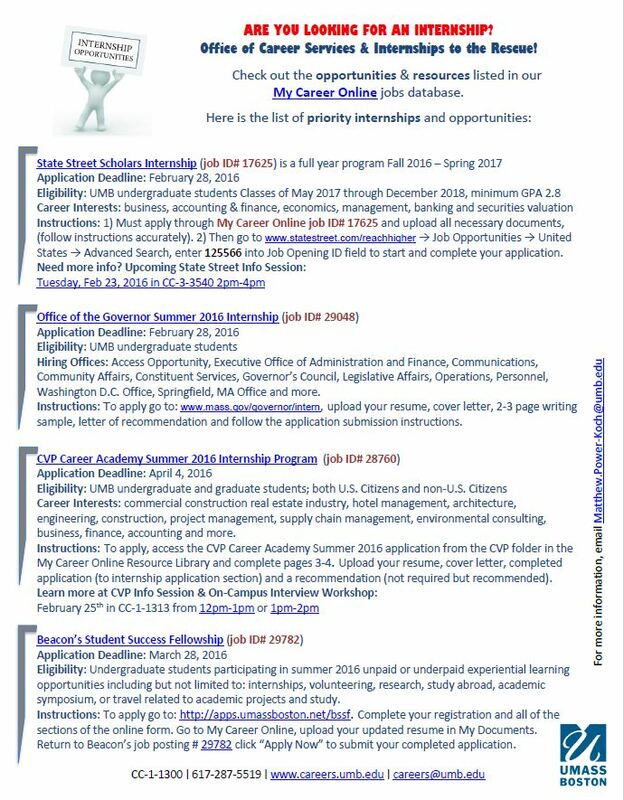 Click CSI Internship Opportunities 2.22.16 to download a PDF of these opportunities. The College of Management U-ACCESS Donation Drive is an opportunity for students, faculty, and staff to give back to the on-campus U-ACCESS Food Pantry. Students who donate 5 or more items in the College of Management Undergraduate Program Office (M-5-610) during the week of February 29th – March 4th will be given a set of questions to respond to. Appropriate, well thought out responses will be awarded 1 MAP mile. The U-ACCESS Food Pantry is in need of non-perishable items such as canned goods, canned proteins, peanut butter, pasta, pasta sauce, as well as personal hygiene items such as toothbrushes, toothpaste, deodorant, soap, shampoo, etc. 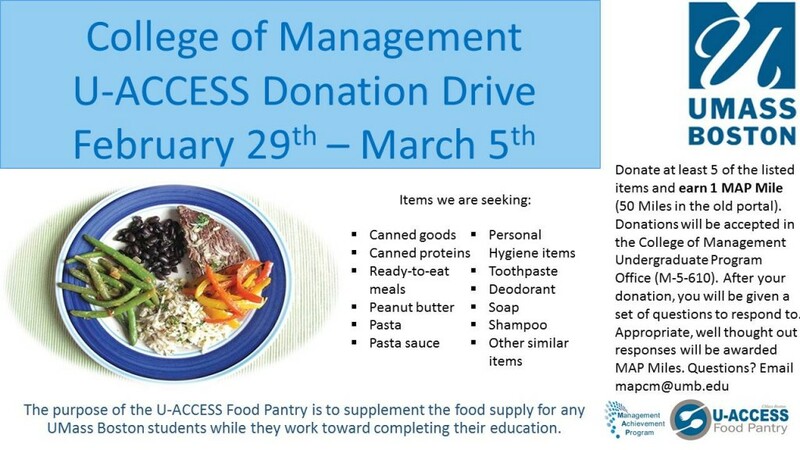 We hope you will consider donating up to 5 items to during the College of Management U-ACCESS Donation Drive by bringing your donations to the College of Management Undergraduate Program Office in M-5-610 Monday, February 29th – Friday, March 4th. Our office is open Monday – Thursday from 8:30am – 6:00pm and Fridays 8:30am – 5:00pm. Students participating in the MAP MOST Conference can bring their donations to the conference on Saturday, March 5th. Questions? Email mapcm@umb.edu. Please remember to check the MAP Student Portal in order to RSVP for these events and verify locations and times. Thank you! 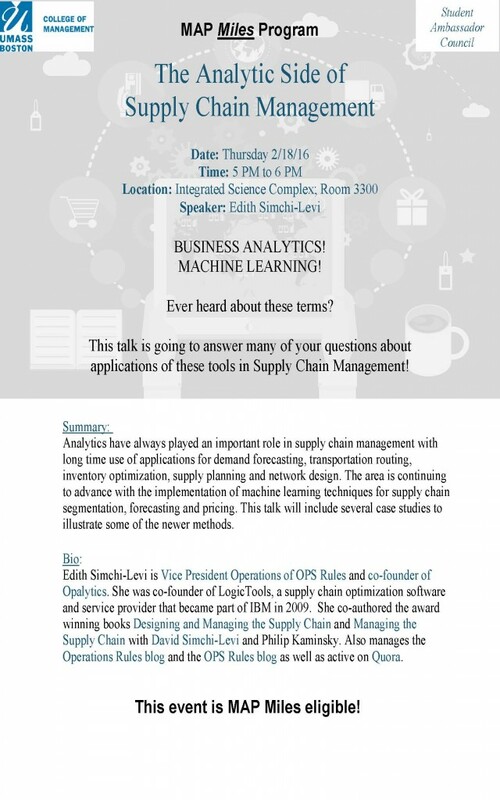 Check out the flyer below for details about a great opportunity to meet an expert from the supply chain industry on February 18, 2016! Here are the MAP Events for the week of February 14, 2016. Remember to check the MAP Student Portal for the most up-to-date information before attending these events! Here are the MAP Events for the week of February 8, 2016.